Storage is always a problem for us, isn’t it? Remember the days when all we had were hard disks with a few megabytes of storage? The days when we marveled at the floppy discs? It is amazing how technology has evolved in the past decades, really. Now, we have hard drives that can contain up to terabytes of data. How cool is that? Even flash disks can contain gigabytes of information! Of course, it seems that in this area, we just can’t get enough – both in quality and quantity. And, if a group of researchers in Tokyo are fully successful, we just might see another generation of storage devices. Eureka Alert just featured the work of Hideo Takezoe and his team of researchers. Apparently, they have been working on liquid crystal technology – the same technology being currently used in televisions and computer monitors. Who would have thought that they could have made progress in using this technology for data storage? The group of researchers has taken advantage of a property of liquid crystals called anchoring transition. In simple terms, this property can be used to write, erase, and rewrite data by using laser beams. The liquid crystal molecules, which are rod-like in nature, are aligned by the application of these laser beams. The result? Rewritable data storage! 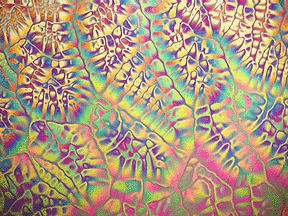 Even better, the liquid crystals are bi-stable, meaning that the orientation is retained in one of two directions. The practical implication is that the storage material does not need power to retain images. Imagine the potential of this technology!